Automotive Moscow, discovered by bike. After Manchester and Vienna, it is time to explore another city by bike: Moscow. As far as safety is concerned, this city is one of the top cities in killing cyclists. As happens more often in this big society, official numbers are not published and it is not surprising you don’t see that many cyclists on the car-driven roads. Sometimes amounting to thirteen lanes, Moscow is a city perfectly made for four-tyred vehicles, not for two-tyred. But, of course, as we are urban explorers, such unfriendly circumstances should not stop us from getting our feet off the ground and pushing them on the peddles. So what is the best route to cycle? 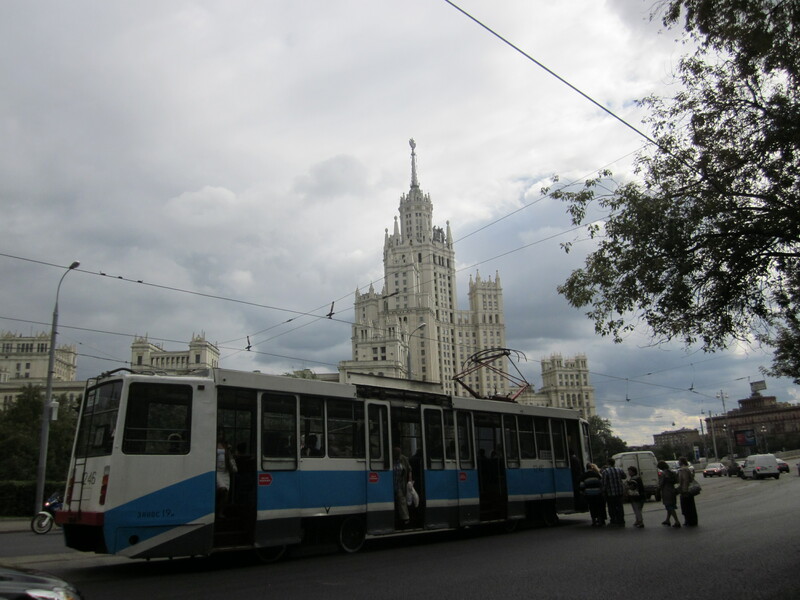 Which streets and boulevards make you capture the Moscovian atmosphere? The best way is to start at the famous Bolshoi Theatre. Built in 1324 and having been the stage for Swan Lake’s 1877 and the Nutcracker’s premières, makes it the most famous dance/ballet venue in the world. When heading to the east and leaving the grand Karl Marx statue on your right side, you will take a right turn on Lubyanskaya and have the boulevard park on your left-hand side. That is where the Moscovian life comes to the fore: Russians eager to catch the sun during summertime are sitting outside with friends and family. For us cyclists, not only seeing this sun enjoyment on your left-hand is nice, but also, this road is descending with a slope of at least five per cent, which makes peddling an unneccesary activity. Your legs can relax for this section. But be aware: do not get too relaxed by not peddling and watching the Moscovites getting sunburned, as the road quickly ends in a large intersection. To be sure you stop on time and in a safe way for the upcoming traffic lights, it would be wise to just brake a bit earlier than normally, as the roads can be very slippery after the Russian street-cleaning vehicles has created a lake on the roads. Being on the intersection, you defenitely want to take a left turn without being hit by cars trying to go straight ahead. You’ll surely want to stop for a lovely little coffee and either a cake or a quiche at Liudi kak Liudi, where Moscow’s young trend-setters share thoughts on current politics while enjoying a smoothie, richly-flavoured cappuccino, or, in the evenings, a refreshing wheat beer from Lithuania. 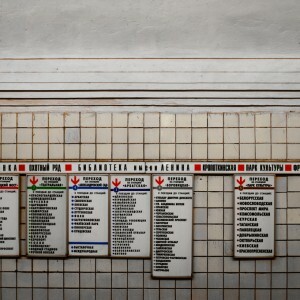 After being re-energised, you’ll turn to the right onto ul Solyanka, which will bring you to one of Stalin’s Seven Sisters: the biggest socialist realist architectural marvel in the Russian capital. This being the Museum of the Russian Icon makes it worth a visit. 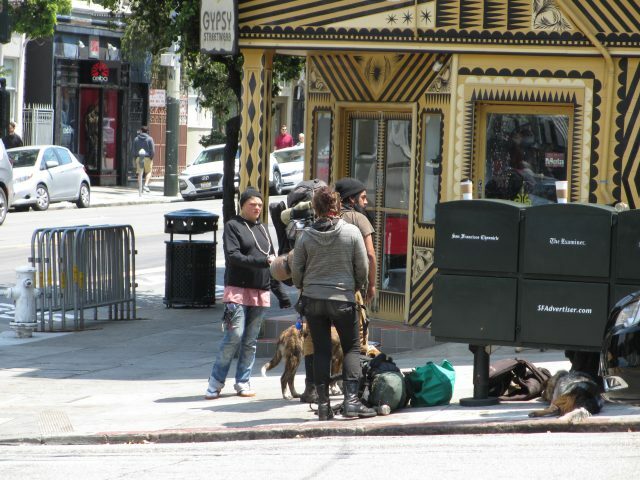 Although, if you are not that much interested in iconography, probably the site on the building is already satisfying. Gaze for a while and you’ll be satiated. But, do not gaze for too long, because you might cycle into the queue for the tram happening in the middle of the road. So, not only cars can be dangerous, but people queueing up amongst the speeding passenger vehicles can be hazardous as well. After having survived that threat, there is a great view ahead of you while ascending the bridge. Your doubts of why you’ve put yourself in this horrible life-taking journey will vanish instantly by looking to the right: a beautiful view on the St. Basil’s Cathedral and the bombastic walls of the Kremlin and its palaces, the primary symbols of Moscow, welcome you to town. 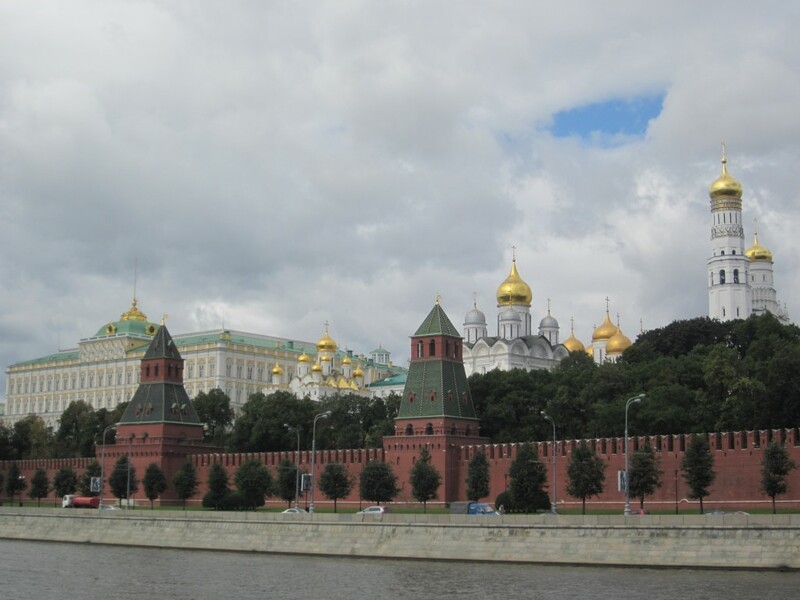 While sweating your polluted body clean, you’ll take a right turn and cycle alongside the river, just opposite of the Moscow epicentre: The Red Square. While still watching out for potholes and crazy drivers of the informal taxi cabs, you’ll again cross the Moskva at the Bolshaya Polyanka. Because a left turn is necessary, you need to make sure you are on the right side of the road before the most ruthless car drivers try to outrun their neighbour in the first twenty metres and instantly forget that there was a two-tyred vehicle just in front of them. 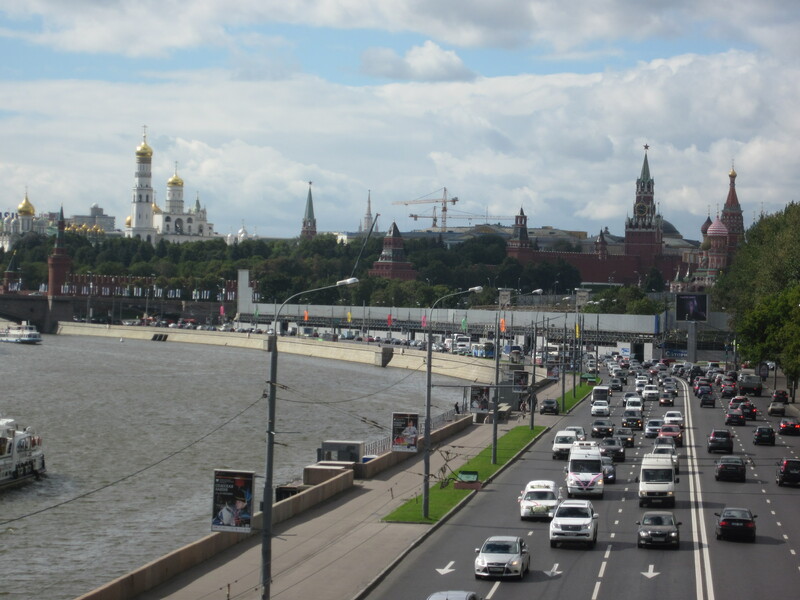 Cycling on the widest bridge of Moscow, another bazzling view will be provided to you with on the right side: still the almighty Kremlin and, on the left, the 300-year-old Cathedral of Christ the Saviour. Take advantage of this relaxing moment, because you need a cool head for the next, and thankfully last, obstacle for the finish. 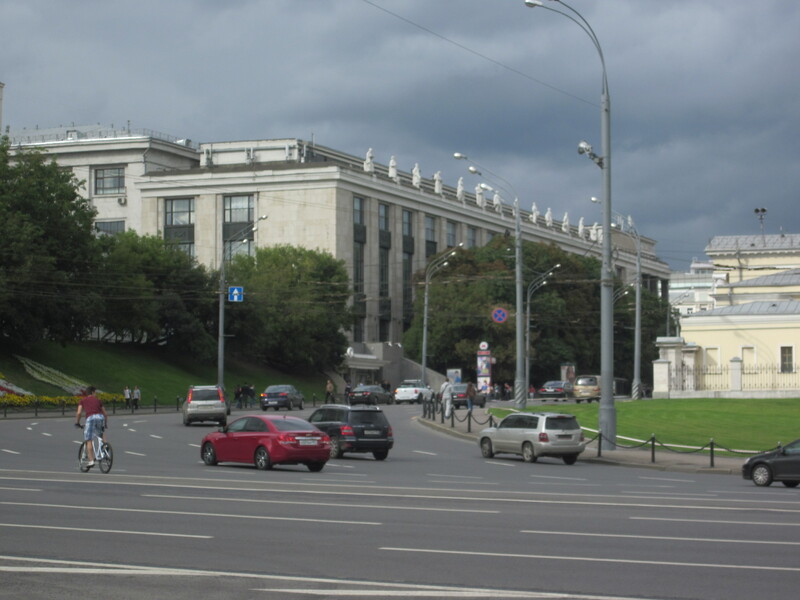 It is the intersection where the six-lane ul Znamenka meets not only the four-laned Kremlevskaya and the two-laned ul Volkhonke, but also the eight-laned Mokhovaya ul. The flowers, greetings and portrait pictures of earlier daredevils draw the picture quite well. Fourteen lanes have to be crossed while SUVs, taxis, Trabants, and other motorised vehicles try to earn their spot in line. If you didn’t already buy a helmet during the first section of the route, this would be a legitimate situation to reconsider that choice. Cyclists normally wait here a few minutes before crossing, and, in doing so, they developed the best survival tactic possible in the city: eye contact with the driver just behind you. That’s a life saver. So, after flirting with every possible car driver, you are 200 metres left from the climax. 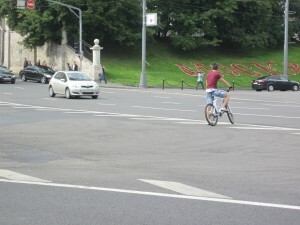 You just have to turn right and cycle on the Red Square itself. With the tomb of Lenin and the lovely, but expensive), mall called GUM, you deserve a stiff drink to celebrate your achievements. And how better to do that in the Russian capital with a nice Russian drink: Vodka! Brilliant stuff Leon. Felt like a very visual and accurate bike tour around Moscow, which would be something to consider when I make my way back to that wicked place one day. What is your sense of a willingness for developing proper infrastructure in the same vein as Amsterdam? Do you think that Moscow is getting closer to a critical mass of the populace changing their mode of daily transportation to the bike? Otherwise, great read! And hopefully that daredevil doesn’t get run over any time soon. @Adam Nowek: Im not sure Moscow will develop new cycling infrastructure. The modal split is still in favour of the car and doesn’t seem to get a relative increase in cycling. Building up such an infrustructure is a big investment and the threshold of cyclists doesn’t seem to be enough to get the necessary social support. As as happened in the Netherlands, before they got the wide cyclinglanes, a heavy public plea was needed. That’s very much true, Leon. You really don’t get the sense that there’s a critical mass at this point in Moscow. 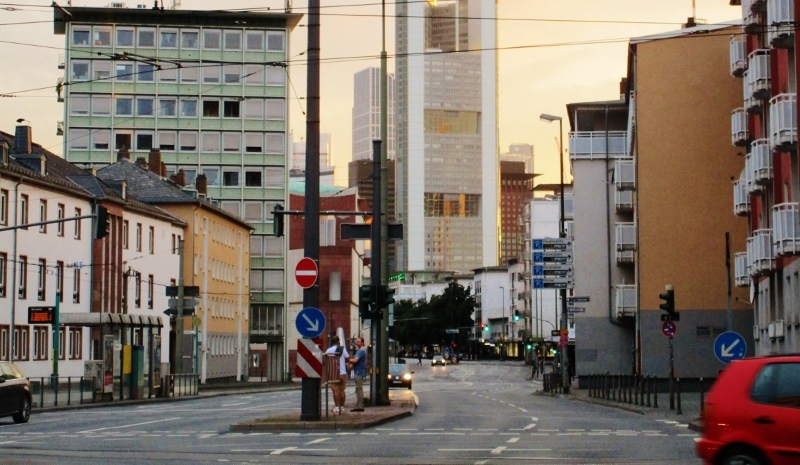 Considering the size of many of the city’s streets, though, it likely wouldn’t be too costly of an exercise to transform parts of those streets into cycling lanes.